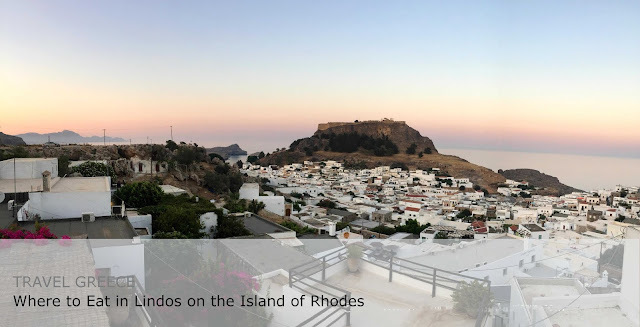 Lindos in Rhodes is one of these picture perfect Greek villages, as soon as you see it, you can’t help but love it. It is an hour by car from the airport towards the south of the island. 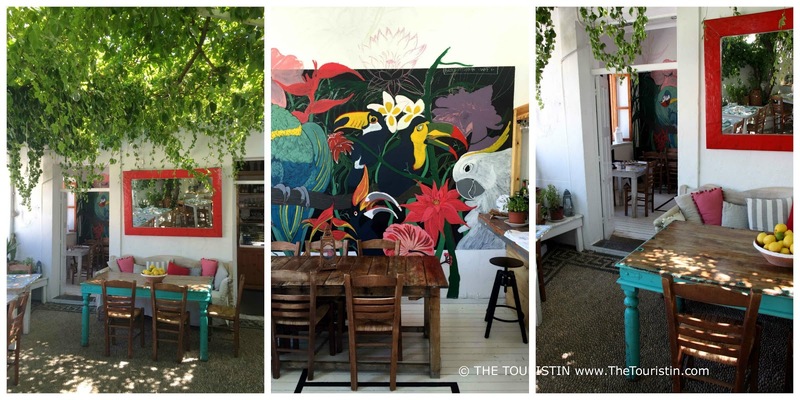 There are many cafés and cheap eats in Lindos, places where tourists can get their fast food fix, but I also found a few outstanding restaurants. I recommend these to people who love food, and generally relish the benefit of service and authenticity, and also to all the ones, who fancy eating in beautifully decorated surroundings. We enter the inner courtyard decorated with wooden daybeds, huge striped cotton cushions, plants in big pots, lanterns hanging from beams on thick sailing ropes and get offered to sit upstairs on the rooftop, right next to the swimming pool. There is pink oleander, intimate wine covered gazebos and an amazing view of Lindos and the Acropolis. This is the type of restaurant where scriptwriters would surely find inspiration for their next big romantic comedy hit. As I asked the waiter about the authenticity of the wine grapes growing over the gazebo, he looks at me somewhat puzzled. He doesn't need to say anything but I can read his mind and he thinks "city slickers, these poor creatures." I spend most of my time in concrete-jungles, and the setting of the restaurant is heaven to me. The service is swift and warm throughout all hours we spend at the restaurant. The dishes are all food creations; there isn't a dull thing on the menu. The chef makes the best use of everything Greece has to offer; he uses simple ingredients and creates real taste experiences. I had lots of tiny pieces of art; in the sense that pretty much everything I had was different to elsewhere. I order the Lollipop Feta for a starter. I would have never imagined that Feta, kataifi, together with honey and cinnamon all covered in pistachio powder can result in a savoury, piquant dish. Another surprise is the Spinach Pie (I love Spanakopita), that came in form of a salad, with loose sheets of puff pastry with raw spinach, seasoned with dill, leek and spring onions. Something really eye-catching happened at the neighbouring table. The waiter served some kind of meat, and the chef burned herbs, placed them over the meat on the plate and covered it with a glass cloche. That way the meat absorbed the taste of the herbs. We asked our neighbours, they said it tasted fantastic. While I was still impressed by this little show my dessert arrived, and it was one more taste surprise. I ordered a Sweet Greek Salad, and the syrupy preserved tomatoes, the olives stuffed with almonds, the thinly sliced cucumber, and olive oil ice cream were all covered in dried olive powder. Nothing on this plate, apart from the cucumber, had I ever eaten before, what an amazing idea for a dessert. Go, have dinner here and be enchanted by the experience, atmosphere and food. There is also a delicatessen at César's Meze Bar and if you like you can take organic herbs, homemade jam or olive oil back home with you. Jump onto their website for more details: César Meze Bar. I would love to provide the address, but the streets in Lindos have no name. Open till late, as in 12pm. This restaurant looks really inviting as we walk past, and lucky us, there is a table available for dinner. As we enter, the first thing I instantly enjoy is how peaceful it is. It sounds cheesy but it is how it felt. 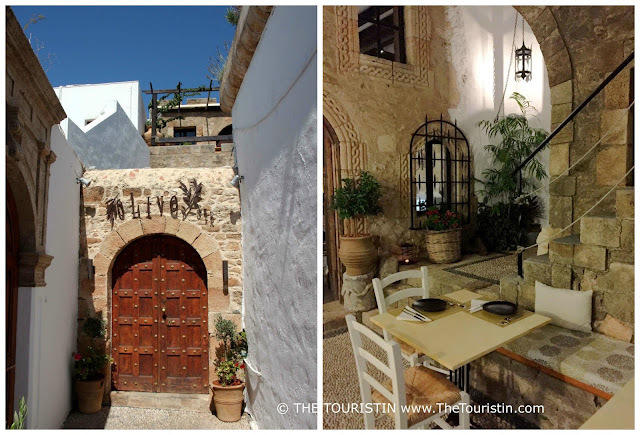 Soon after we are seated in the small inner courtyard with the for Lindos typical pebble flooring, a waitress serves us two glasses of bubbly. What a nice welcome. 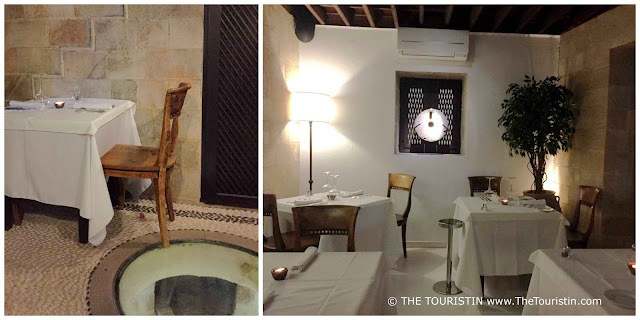 The restaurant is elegantly decorated, dark brown wood, bright exposed stone walls and white table linen, and it could easily survive in any big European town I have been to so far. I absolutely enjoy the chat with the owner and after he finishes work, his son takes over, and he is just as friendly to talk to. The typical Greek Aubergine Salad drizzled with olive oil and Stuffed Wine Leaves is a great start to the meal. With the main it gets slightly Italian, I eat Tomato and Feta Pasta. The portion is too huge, but I find out it is made with exactly 100g of pasta and that is the amount that gets used for preparing pasta dishes. I take that as a precious advice back home, and have to say it is magnificent information. The Crème Brûlée for dessert is the classic version, it has a good consistency and plenty of vanilla flavour. This is a fine dining family business, and I love that a lot. In ancient Greek mythology ambrosia is the food of the Greek gods; whoever eats it, becomes immortal. If the family keeps up the good work (I have no doubt about it) this restaurant is a timeless success story. Same here, I can't give you the address, but please jump onto their website for all the info: Ambrosia. Open till late, as in 12pm. This is like having dinner at a friend’s place that is an exceptionally great cook and probably knows a few things about interior design too. We all have one of them in our lives I guess. This Italian restaurant is a few steps out of the centre, close to the Acropolis with a view of the sea. The wall mural in one of the dining rooms by artist Ioannis Spuropulos is impressive and works exceptionally well with the whitewashed walls and colourful decoration of the place. Broccolino is relaxed, casual in appearance and with fun waiters but serious about food. When the starter, the Bruschetta, arrives I’m not too sure whether I can eat the other starter too, the Courgette Carpaccio with mint and hazelnuts. The Bruschetta might go through as a main course for some, but since it is prepared with homemade bread and wonderfully seasoned, I eat it to the last crump and have no problem to eat the Courgette Carpaccio with mint and hazelnuts as well. I was so silly to not read the menu properly, and am surprised to find pancetta in the gnocchi with black truffle I ordered as a main. The waiter takes it away and it is cooked fresh without pancetta. There isn't even an eye roll or anything like that with this episode. I (naturally) offer to pay for both versions but they don’t want to hear anything about it. Before we leave, after a few joyous hours in this magical place, we drink a Mastika, a greeting from the kitchen. And again, no address. It is a few steps out of the village on the way to Pallas Beach, one could say it is the neighbour of the Chapel of St George. Find Broccolino on facebook. Open till late, as in 12pm. It is late at night when I walk past this place, and that means no more dinner today. The chef guides me through the romantic courtyard and around the olive oil cellar, a former olive oil producing workshop, and shows me the upstairs terrace of the restaurant. Olive oil is a big part of the Greek diet; I book a table for the following night. We sit in the cosy upstairs dining area with a direct view of the Acropolis. Pebbled flooring, white washed walls, exposed stone walls, huge flower pots. Our white chairs go perfectly well with the black and also white plates we eat from, this place is lovely decorated. The bread with olives and olive oil is as good as it gets, and I enjoy it together with my starter, the Manouri Cheese from Northern Greece. The fava is made from yellow lentils, and as far as I know, eaten traditionally all over Greece but comes from Santorini, they have planted fava there for thousands of years, and it thrives in the volcanic ash. Due to a lack of vegetarian options I order the Summer Salad with avocados and strawberry vinaigrette. The version of the Baklava with pistachio is typical for the Aegean Islands. There is so much to discover during one dinner, this is an absolutely fantastic place for a great foodie night out. And again, no address. It is in the village and near the pharmacy. Visit their website for more information: Olive Street Restaurant. Open till late, as in 12pm. Where else can one experience a beautiful dinner in Lindos? Can’t wait to hear from you. If you would like to know more about Greek food, read Culinary Safari through Athens.Would you like to know what else you can do in Lindos? Read Travel Greece. A guide to Lindos: smell, feel, sleep, see, touch and take.